Create your own custom costumes to decorate this owl for holidays and other occasions. Stamp the owl onto white card stock with black ink, color with pencils and cut out (omitting legs). Trace the cut out owl onto white card stock. Draw accessories to fit the image. Outline the accessories with a Permawriter pen. Color with pencils and cut out. 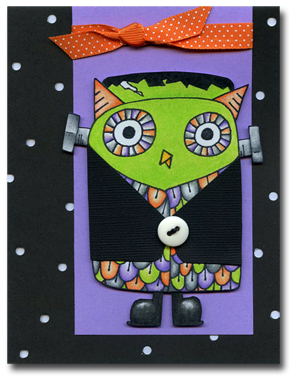 Trace the cut out owl onto black card stock and create the jacket. Assemble the pieces to the backside of the owl, add button on the jacket. Affix the owl to a cut piece of Wisteria card stock. Wrap with orange ribbon. Punch small holes in a black note card to create evening stars. Affix the owl panel to the card. Hand draw a hair line, bolts, and big boots for accessories. When cutting them out, leave extended tabs so they can be easily adhered to the backside of the owl.